Writing about my early training with Spy and teaching engagement made me think about Pi. 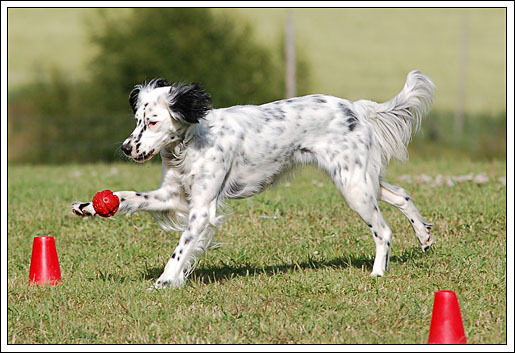 She is an English Setter that moved in with us 10 years ago (she is now living a spoiled and active life with Thomas’ sister in Oslo). She came at a time where I was really excited about training a new puppy, so even though she was bought for hunting, I started training her with obedience in mind. 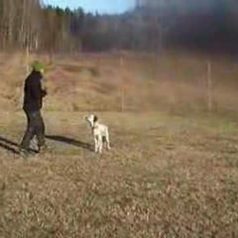 She was such a fun puppy to train – very focused and deliberate in her actions. She learned lots of tricks and behaviors for obedience and we had a great time. She was born in summer, so we spent most of our training time in the kitchen during the winter when she was half a year old. As spring came, we started to train more outdoors. She went from puppyhood into adolescence and hunting drive kicked in. This coincided with lots of spring birds competing for her attention. I fel like I didn’t have that focused dog from the kitchen anymore, and I decided that I probably needed to interrupt her looking at the birds, as it might be very reinforcing to a young setter. So whenever she was disengaged and looking for birds (and sometimes just staring at the horizon, as setter do) I’d call her back to me. I’d use her name or a cue like “heel” to bring her to me, and she always responded and started to work. A few months after that decision, we held an obedience seminar away from home, and I used Pi as a demo dog for down from motion. She started out a bit disengaged and split her attention between me and the magpies on the ground. I then decided I wanted her to offer a down without a verbal cue and started waiting her out. She didn’t quite understand what I wanted, but tried lots of other things. As I remembered it, she worked for several minutes without a reward, and without ever looking away from me. She was the same dog that I usually had in the kitchen when we were working on tricks. And then it dawned on me. She wasn’t “distracted”, “hunting dog” or “teenager” – I had created a less engaged dog outdoors because I’d shown her that she never had to be attentive to me. I always told her when it was time to work. When I realised this, we went to a dog training club to train. We were travelling, so it wasn’t where we usually trained and I didn’t know any people there. It was mostly older men with GSD:s and they looked at me very strangely as I started my session. I kept her on a leash and let her stare all she wanted at things. When she finally looked back at me (after what felt like minutes), I threw her a party with the best rewards I had and then waited again. She stared away from me again, but checked back sooner this time. She got the idea after a few rewards and turned back to me immediately once I stopped rewarding. I could increase my criteria to coming to heel position and then heeling for longer and longer stretches. This session was pivotal to us. From thereon, everything went smoothly. Pi did her first obedience trial at 11 months old (still the youngest dog I’ve ever trialled in obedience) and did great. She immediately qualified for the next level and we had a great time in the ring despite birds everywhere. My experience with Pi changed my outlook on engagement a lot and made me realise that most dogs that are distracted are so because we allow it. It doesn’t matter if we use lures, cues or corrections – the outcome is often the same. 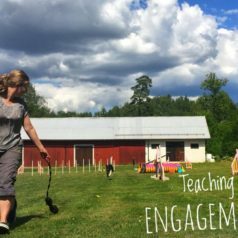 Only when we make it the dog’s responsibility to be engaged in order to get rewards will we have true and lasting engagement.